Empty – Paper Never Refused Ink! silent and stiff, the red shirt on the tiny frame. change your name to accept a bowl of soup. in three languages invoking empty prayers. when bread or lifejackets would be better. Delighted to be able to say that this was published in the 1st edition of the Bangor Literary Journal, it is a privilege to be in the company of many wonderful writers and poets within its pages. You can view their current issue here and you can download the issue feature this work here. The image above is the work of Daniel Etter. A noted photographer who secured the Pulitzer prize in 2016 for this image which he titled ‘Exodus’. 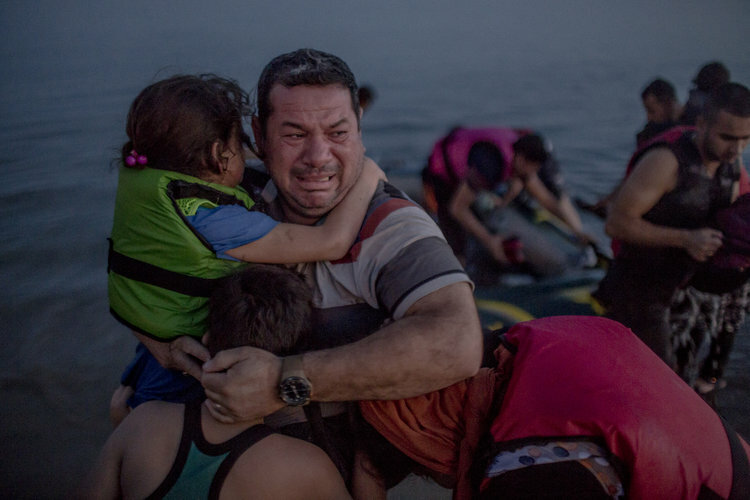 It shows Mr. Laith Majid Al Amirij, an Iraqi refugee from Baghdad, who breaks out in tears of joy, holding his son Taha and his daughter Nour, after they arrived safely on a beach of the Greek island of Kos, Greece, Aug. 15, 2015. The group crossed over from the Turkish resort town of Bodrum and on the way their flimsy rubber boat, crammed with about 12 men, women and children, lost air. Fearing that they get sent back to Turkey and upon being told so by their smuggler, Mr. Al Amirij’s wife initially identified them as Syrians from Deir Ezzor. The family has since made it to Berlin, Germany. We must be willing to bear witness, often in non judgemental silence, we cannot be mute afterwards. Next Post Changing of the Watch.